Array. En fait, le livre a 176 pages. 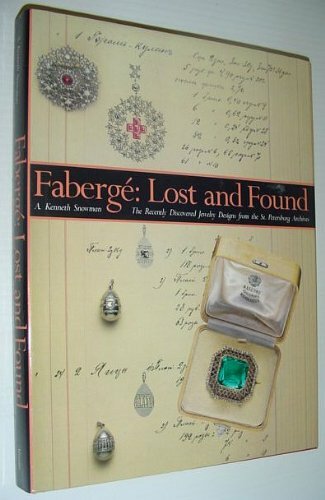 The Faberge: Lost and Found : The Recently Discovered Jewelry Designs from the St. Petersburg Archives est libéré par la fabrication de Harry N Abrams Inc. Vous pouvez consulter en ligne avec Faberge: Lost and Found : The Recently Discovered Jewelry Designs from the St. Petersburg Archives étape facile. Toutefois, si vous désirez garder pour ordinateur portable, vous pouvez Faberge: Lost and Found : The Recently Discovered Jewelry Designs from the St. Petersburg Archives sauver maintenant. For more than 25 years, Carl Faberge and his firm served as jeweller and goldsmith to the tsars of Russia, European royalty, and the powerful and influential throughout the world. The masterpieces created by Faberge in the late 19th and early 20th centuries are almost legendary treasures of superb workmanship and originality. A. Kenneth Snowman tells the story of his recent and astonishing discovery in St Petersburg of two of the original design books from the House of Faberge. Within their pages are countless meticulous watercolour and ink drawings of virtually every item made by the company from 1909 to 1915. Each design is dated and accompanied by detailed handwritten instructions as to composition and execution. Hundreds of these invaluable and incredibly beautiful drawings are reproduced here for the first time, most in full colour, with captions describing the gems, the materials to be used, and the date of manufacture. Often the actual finished pieces are photographed next to the original drawings. Among the ingenious marvels are those commissioned for the 300th anniversary celebration of the House of Romanoff, and the famous miniature and large Imperial Easter eggs, including the one owned by Queen Elizabeth II. Gold boxes, animal and bird carvings, necklaces, earrings, pendants, rings and diadems are amongst the jewels on display. A. Kenneth Snowman was curator and wrote the catalogues for the Faberge exhibitions at the Victoria and Albert Museum, London, in 1977 and the Coopor-Hewitt Museum, New York, in 1983. He has written and edited many other books, including "The Master Jewelers" (Thames and Hudson, 1990).